Academy Award nominee Benedict Cumberbatch lends his voice to the infamous Grinch, who lives a solitary life inside a cave on Mt. Crumpit with only his loyal dog, Max, for company. With a cave rigged with inventions and contraptions for his day-to-day needs, the Grinch only sees his neighbours in Who-ville when he runs out of food. The Grinch is in cinemas now. The competition ends at 23:59 on 25 November 2018. 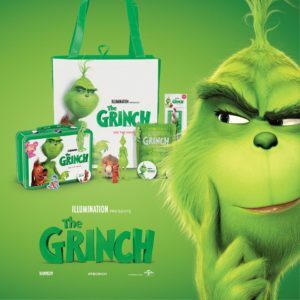 11 Comments for "Win The Grinch Merchandise!" It looks like great fun, I will be taking my granddaughters to watch this. Looks great fun for all the family to watch . It’s sure to be another hit!